Months have passed since I informed my family and close friends that instead of attending graduate school in the upcoming scholastic year, I would instead be teaching English in Indonesia through the Fulbright program. Finally, after changes in grant periods and various difficulties in acquiring visas, it is time to fly. If all goes well, in a few days’ time I will be on the other side of the world. All summer, I have been describing Indonesia’s whereabouts in this fashion. Though it is the fourth most populous nation in the world, and takes up just about as much space on the globe as the United States (granted, most of said space is water, but nonetheless, it is an expansive archipelago, and deserves the recognition), very few people seem to know very much about the country of “unity in diversity.” I usually start by trying to establish Indonesia’s position in relation to Australia, India, and Japan—countries of which I (wrongly) assumed most people would know the location—but more often than not I illustrate where I am going by saying “If you were to drill a hole straight though the Earth and into the Southern hemisphere, you would end up on the island of Java, where I am going.” I’m not convinced that those with whom I am speaking know where I am headed, even after my explanation accompanied by exaggerated hand gestures, but at least it is clear how far away I am going. 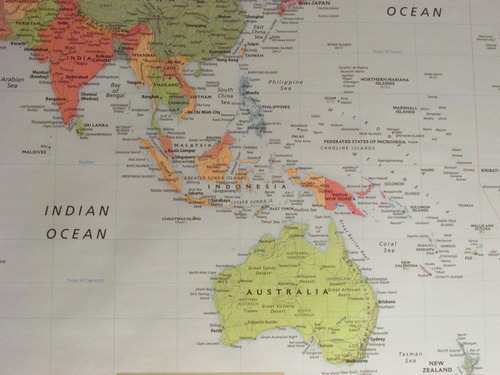 The other side of the world: it is this idea I keep returning to. 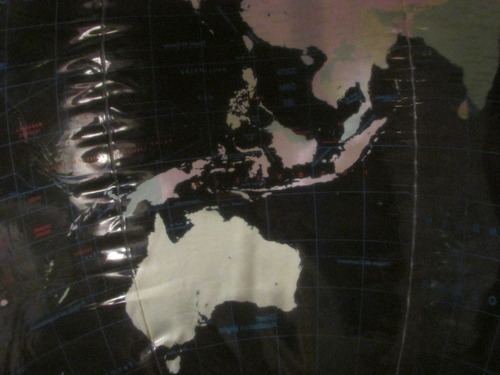 I have an inflatable globe (i.e., a clear beach ball on which is printed a political map of the world), and have on occasion placed my eye near the Massachusetts shore line and peered through the center of the Earth at a blank, mirrored image of Indonesia. Though it is merely a smattering of white amid clear plastic, I have never found a sight more thrilling, or terrifying. I could not possibly be going further from everything I call home. I will be living in the same country as the Komodo Dragon, a creature which might as well be out of mythology for a northeastern farm girl like me. I am going to a place where the seasons do not coincide with the four I have recited in classrooms since Kindergarten, in every language I have ever dabbled in. Because I will be in the Southern Hemisphere, even the stars will be different. I know I should be concerned with more significant differences than the wildlife, weather, and night sky. Though I have been trying to learn Bahasa, the national language of Indonesia, during my lunch breaks all summer, I am sure I will be helpless if I lose my way during my first week or so of orientation; I am an American woman spending nine months in the largest Muslim nation in the world, as every person who has heard of Indonesia is determined to emphasize to me; I will be twelve time zones or more away from everyone who has laughed with me or offered their shoulder to cry on. And yet, it is dragons, seasons, and stars that are at the forefront of my mind. However, not everything will be different. The other night, I stood next to the chicken coop with my mother, staring at the night sky. 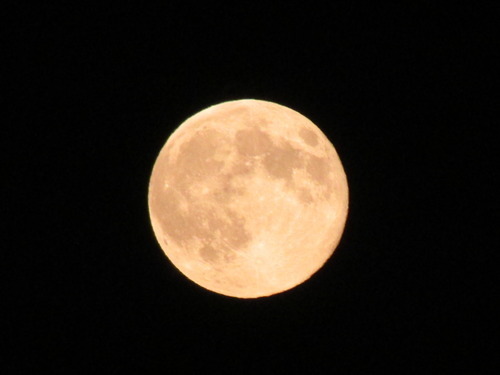 We were both armed with our cameras, trying to capture the full moon. I realized in that moment, that though I would be farther from my family than I have been before, we can still look up and, in theory at least, see the same moon. Perhaps this is why I have chosen the three differences I have: because they allow me to pinpoint just how similar opposite sides of the world can be, if I’m willing to search for the likenesses. There may not be dragons in the northeast United States, I wonder if they can really be any more majestic than the red-tailed hawks that scan our freshly-mowed fields for mice, their wings dark against the blue summer sky. It may not snow in December, but I predict the dry and wet seasons will have singular personalities, and come accompanied by just as many jokes and complaints as construction season in Central New York. And though the constellations will be different, there will still be stars. This entry was posted in Uncategorized and tagged Indonesia, travel, travel blog. Bookmark the permalink.